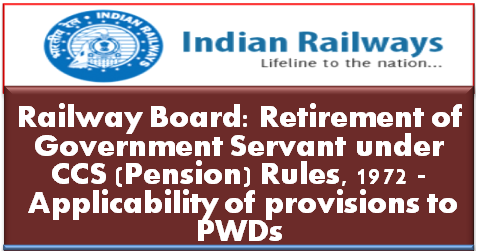 Sub: Retirement of Government Servant under Central Civil Services (Pension) Rules, 1972 and Central Civil Services (Extraordinary Pension) Rules-applicability of provisions of “Persons with Disabilities (Equal opportunities, protection and rights and full participation) Act, 1995”. A copy of Department of Pension & Pensioners Welfare (DOP&PW)’s O.M.21/1/16-P&PW(F) dated 30th September, 2016 on the above subject is enclosed for information and compliance. These instructions shall apply mutatis mutandis on the Railways also. Rule 38, 48 & 48-A of the Central Civil Services (Pension) Rules, 1972, correspond to Rule 55, 66 & 67 of the Railway Services (Pension) Rules, 1993 respectively and Civil Services (Extraordinary Pension) R 1939 correspond to Railway Services (Extraordinary Pension) Rules, 1993. De art ens; of Personnel & Training’s O.Ms No. 18017/1/2014-Estt. (L) dated 25.02.2015 and No. 25012/1/2015-Estt. (A-W) dated 19.05.2015 referred to in the enclosed O.M. dated 30.09.2016, have been adopted on . Railways vide this office’s letter E(P&A)I-2017/CPC/LE-5 dated 30.08.2017. Retirement of Government Servant under Central Civil Services (Pension) Rules, 1972 and Central Civil Services (Extraordinary Pension) Rules-applicability of provisions of “Persons with Disabilities (Equal opportunities, protection and rights and full participation) Act, 1995”.